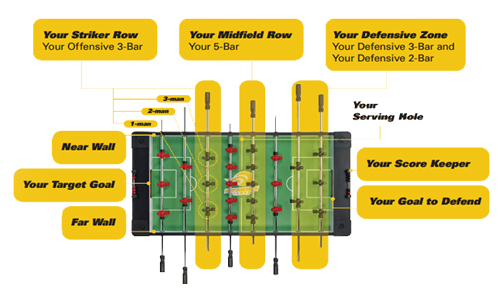 We, at School of Foosball, want to provide you with everything you need to get better at foosball. More then that, we want you to enjoy your foosball experience. Much like soccer, the object of foosball is to score the ball in the opponents goal. The game can be played with 2 players or up to teams of 2 on each side of the table. Tournament and bar foosball is played with a total of 9 balls and the first team to 5 goals wins the game. If you are a beginner foosball player and are still learning to play the game, Foosball Information 101 suggests you play the first team to 10 goals because there will be numerous loose ball goals and "spray" goals that are non-intentional. If this were to happen 2-3 times per game, you can see why a quick game to 5 would make it difficult to have a competitive game.